Last season Mathew Barzal was the rookie sensation, and one of the team records he tied -most goals in a game by a rookie he now shares with Mats Hallin, who had a hat trick on this day in 1983. Here's how I described it in It Happened at the Coliseum, when the series ran originally in 2015. (1983) – Mats Hallin put his name into the Islander record books, tying the franchise rookie record with three goals, as the Isles pounded the Flyers 9-2. The Isles jumped all over the Flyers in the first period, scoring four goals. 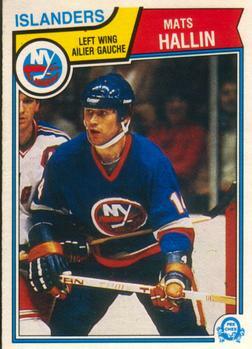 Ten different Islanders had points in the period including a player more known for his defense, Dave Langevin. Langevin earned assists on three straight goals in one of the bigger offensive performances of his career. Dave Langevin. It was used at the St. Paul Civic Center. Hallin had the second of those four goals, and then completed his hat trick by scoring both Islander goals in the second period. Mark Howe had the first of the two Flyer goals -- just 8 seconds into the middle period. Ilkka Sinisalo had Philadelphia’s other goal – ironically it came at the 7:11 mark of the second period. Besides Hallin’s hatty, six other Islanders scored the other six goals. Denis Potvin did not have any of the goals, but the Islander captain did have four assists. It was the second straight game that the Isles scored 9 goals; the only time in franchise history that they scored at least 9 goals in consecutive contests. Also on this date: (2004) – Jason Blake scored all three goals, completing a hat trick into the empty-net in the final second, as the Islanders beat Minnesota 3-1. Rick DiPietro made 16 saves for the Isles, while his future teammate, Dwayne Roloson, stopped 21 shots for Minnesota. All-time, the Isles have played seven March 19th games at the Coliseum and finish with a 5-1-1 record on this date at 1255 Hempstead Turnpike in Uniondale.